This project is the logical continuation of the ARDA Project based on the Biefeld-Brown effect. 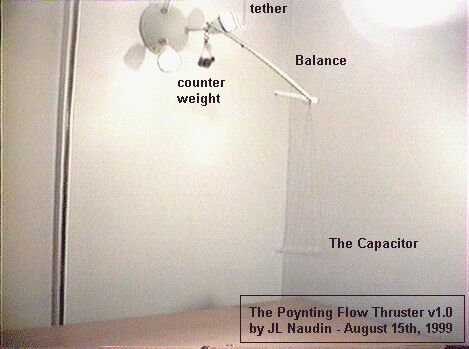 The purpose of this experiment is to demonstrate that it is possible to generate an unidirectional thrust by using an asymmetrical flow of the Poynting energy in a capacitor. 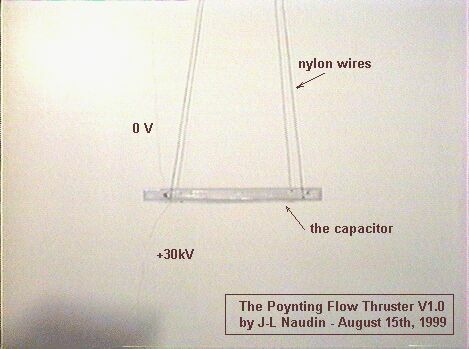 The main idea is to check if an asymmetrical energy flow during the charging process of a flat capacitor is able to generate a thrust. 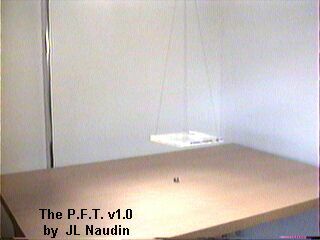 Experimental setup: The flat capacitor has been built with a common CD-ROM plastic box ( 125 x142 x 10 mm )made with plexiglas (as dielectric ( thickness = 1mm ). The outside and the inside have been covered by an aluminum sheet (120 x 110 mm) . 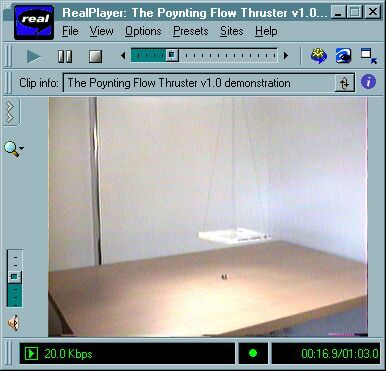 The apparatus has been tethered with nylon wire on a specialy balanced equipement. The edges of each armature have been covered by an adhesive tape for reducing the leakage current and some eventual striking. The 30kV DC High Voltage generator has been placed under a wooden table just under the rotation axis. Two thin copper wires have been connected at 10 mm distance from the edge of each armature ( one has been connected to the zero potential and the other to the 30kV DC High Voltage generator ). 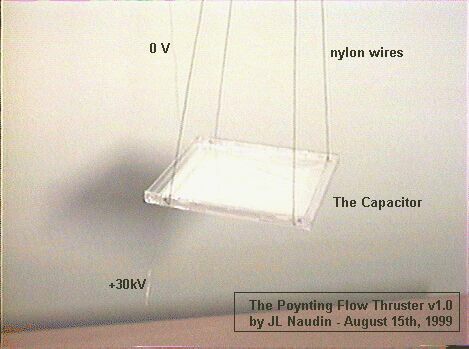 The capacitance of this capacitor is 15pF ( measured with a digital capacimeter ), at full charge, this gives an electrostatic energy of 7 mJ . (73) Owners (Country): Fam, Wagih Z.